To make a larger quantity of bannocks, it’s better to make up more than one batch of the mixture rather than doubling the ingredients because as the mixture cools it gets harder to work with – too much moisture is absorbed and the bannock dough won’t stay doughy enough and they’ll crumble too easily. Warming the bowls and utensils prior to making up the mixture helps to keep the dough more workable. I’ve had a hard time getting the hang of these ones and really the trick with them, I’ve found, is to bake them rather than fry them, and not worry about using extra oatmeal on the board as you flatten them out. If you make the dough up in your hands so it holds together well but isn’t too moist, then you should be able to flatten it straight out onto the baking tray. I used a large round cutter to neaten off the edges of the bannock pictured, right, and with the leftovers I made the bonnach fallaid. The bannock could have been a little thinner, really, but I like them quite thick with lots of cheese; they can be made in a more rounded shape, like the Fife or Brodick bannocks but seeing as these are very hard, it doesn’t work so well (in my opinion). 1. Heat the oven to around 190C. 2. Prepare a baking sheet for the bannock to go on when it’s ready to cook. 3. Melt the fat and have some hot water ready – hot from the kettle or tap is fine. 4. Mix the oatmeal, salt, bicarbonate of soda and any optional ingredients into a bowl and make into a mound in the middle with a well pressed into it. 5. Pour the hot fat into the well, and fold the meal mixture gradually into it, stirring sunwise. Work quickly from this point on because the dough will be hard to work with once it cools and the meal has a chance to absorb the moisture. 7. Using a little extra oatmeal strewn evenly across the work-surface, if the dough is too moist at this point, flatten the dough out into a round shape and use a large cutter to neaten off the edges (if you like), and use any extra dough left as the bonnach fallaid (see step 11). Alternatively you can shape the dough into a thicker, more rounded form like a bun. 9. Each farl can be decorated with patterns to distinguish who it’s for, if necessary, or else bless the bannock for the family as a whole again. 10. Any bannocks that break are traditionally considered to be an ill omen and are not used; it’s best to leave them as an offering. 11. Use any remaining dough to mop up the fallaid and roll into a cone shape as before, in the palms of your hands. Add a little extra warm water if necessary to get all the meal and flatten the dough into a thick bannock in the palm of your hands. 12. Make a hole in the centre of the bannock using your forefinger – or get a child to do it if you can, as was traditional. This bannock is not meant to come into contact with metal, but that’s not necessarily feasible these days. Once cooked, you can keep it for use as a charm, give it to the child that helped make it, as a treat, or leave it as an offering to the Good Folk. 13. Bake in the oven on a baking tray at 190C/375F/Gas mark 5 until they’re cooked (about 30 minutes for the thinner oatcakes). 14. Serve while they are still warm with lots of butter and a generous dod of sheep’s cheese, or jam/jelly. 1 Ingredient amounts taken from here. 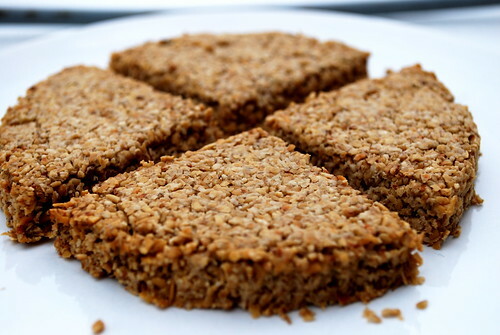 The recipe and method is very similar to McNeill’s oatcake recipe in The Scots Kitchen, though she specifies only one teaspoon of fat, one pinch of bicarbonate of soda, and a pinch of salt along with as much warm water as needed – p172. 2 See Carmichael’s Carmina Gadelica, 1992, p590-591. 3 See Carmichael’s Carmina Gadelica, 1992, p590-591.